I was about seven years old when my dad and I drove into town and stopped at a pet shop where chicks and ducklings were on display. We went inside the store and, when my dad and I left, there were three of us...my dad had actually bought a duckling for me! I never asked him why he made this out-of-character purchase, but I think we were both glad that my mother was somewhere else when we drove up the driveway. I fed and watered my new little friend, Fluffy, every day and kept his cage clean. That duck followed me everywhere and I was equally attached to him.We spent a happy, blissful summer together, but when fall came, my mother decided that he had to go. It was a very sad day for me when I had to leave my dear little duck at a farm. In spite of that childhood experience, all poultry, including duck, was fair game for my dinner table. 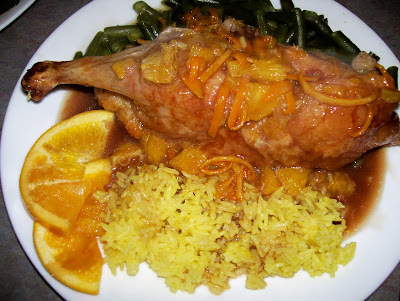 When I discovered the recipe for Duck a L'Orange, I knew I had to try it. The orange sauce, which is the main part of this recipe, must have been created by a master chef...it makes this dish an elegant and special dining experience. Note: While the sauce recipe is more complicated than most family fare, it is well worth the effort to make for a special, dinner-for-two. Remove skin from duck before eating and have plenty of napkins on hand if the half-duck servings are to be plated. An easier way to serve this meal is to remove the meat from the bones prior to serving. Rinse bird; pat dry. Prick skin well all over with fork so fat will escape while it bakes. Season bird cavity with salt and pepper; place quartered orange inside. Set the bird, breast side up, on rack in a shallow roasting pan. Roast, uncovered, in a 375 degree oven for about 1 ½ hours. Raise temperature to 425 degrees; roast 10 minutes more. (To reduce splattering, suction grease out of roasting pan with a baster as needed). About an hour before serving, combine neck and giblets and beef broth in a saucepan. Simmer for 30 minutes uncovered or until drained stock measures 1 cup. Preserve stock and discard giblets and neck. Cut peel from 2nd orange; slice peel into julienne strips with sharp knife (remove white membrane). Section orange pulp and set aside. Simmer peel in the 1 cup water for 15 minutes; drain. 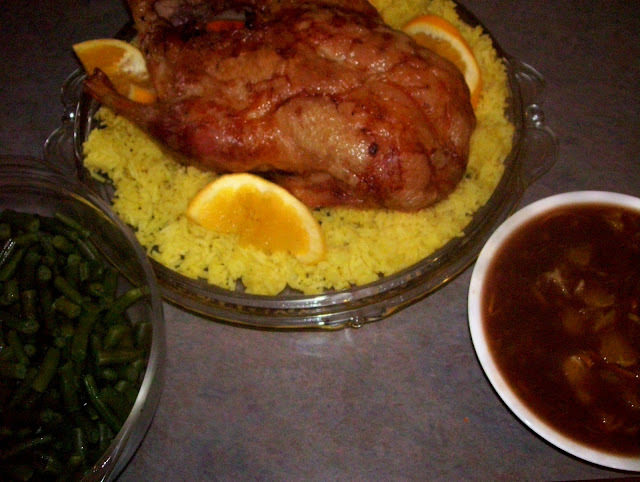 Split roast duck lengthwise and place on serving plates. Top with orange slices and divide sauce over each bird half. Makes 2 servings. What an amazing looking recipe. I'm not sure I'm brave enough to try it, especially in our little London kitchen. I still can't believe you have collected so many delicious recipes. I promise you that Holly and I will treasure this for the rest of our lives. Love you mom, and thanks for the memories.